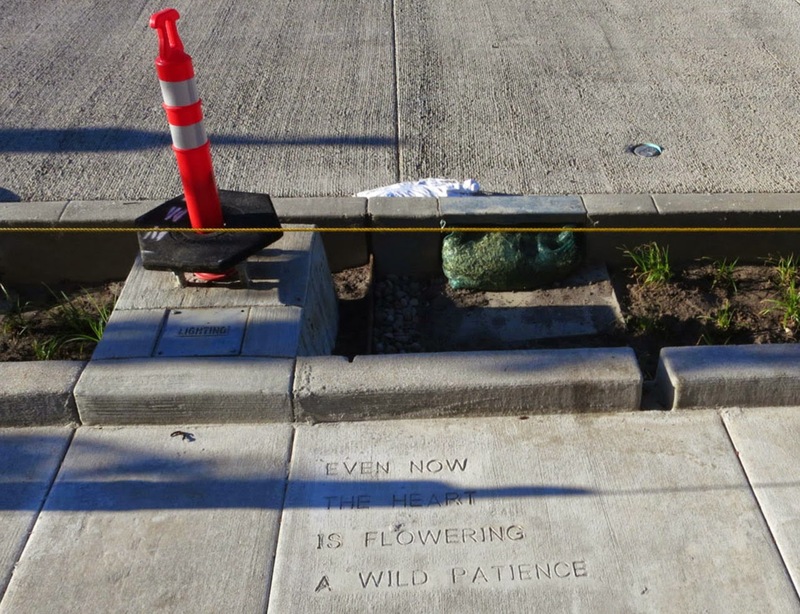 Most of the “Impressed Concrete” installations have taken place on the west side of the Willamette along SW Lincoln St. to this point. 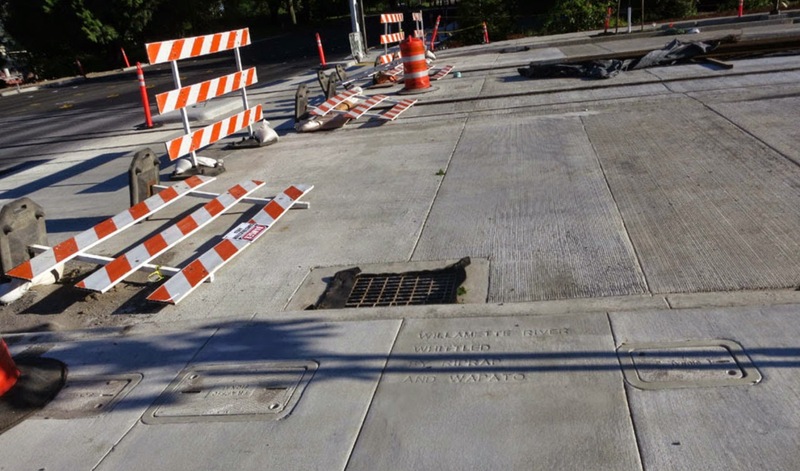 The photos below were all taken of stampings between SW Naito and SW 1st on Lincoln. 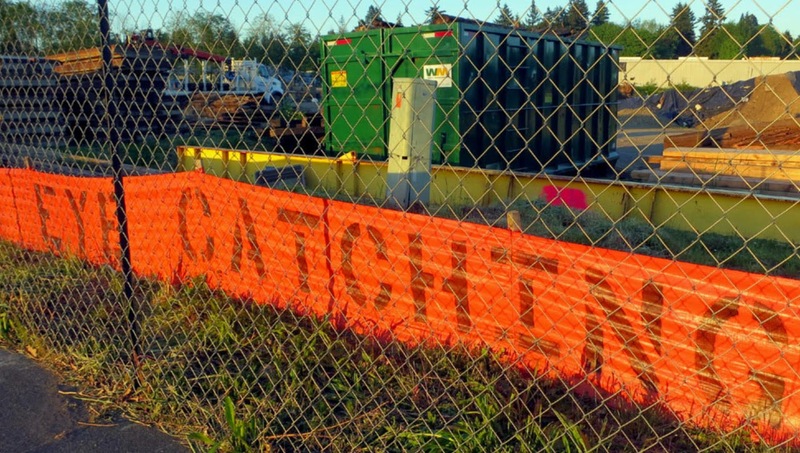 This area is still a construction zone, so the public is not yet permitted to access the area. 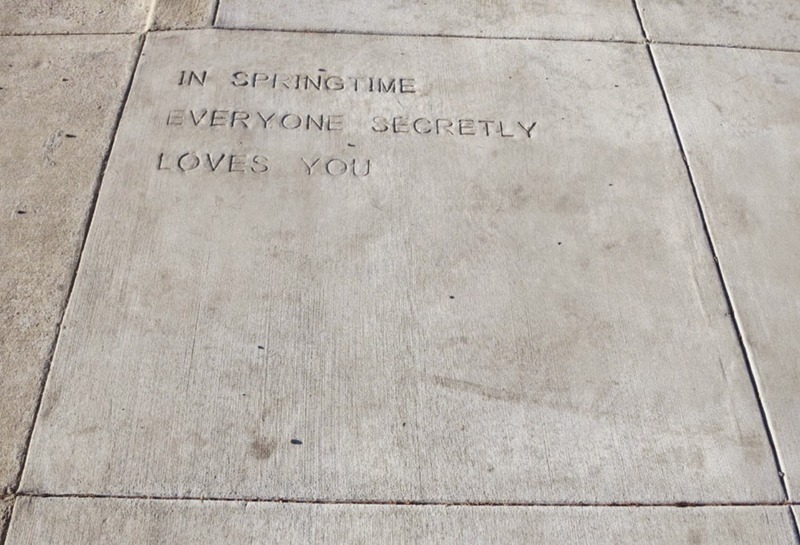 SW Lincoln, between 1st and Naito. 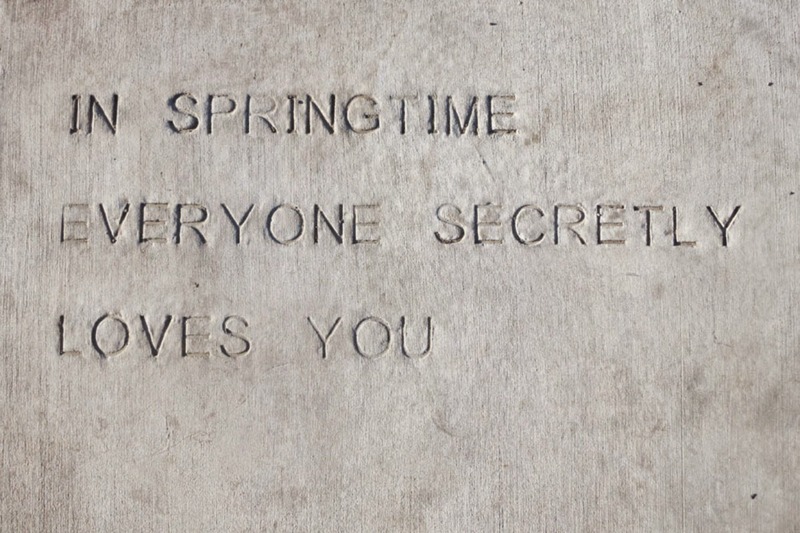 “IN SPRINGTIME EVERYONE SECRETLY LOVES YOU”, by Scot Siegel. 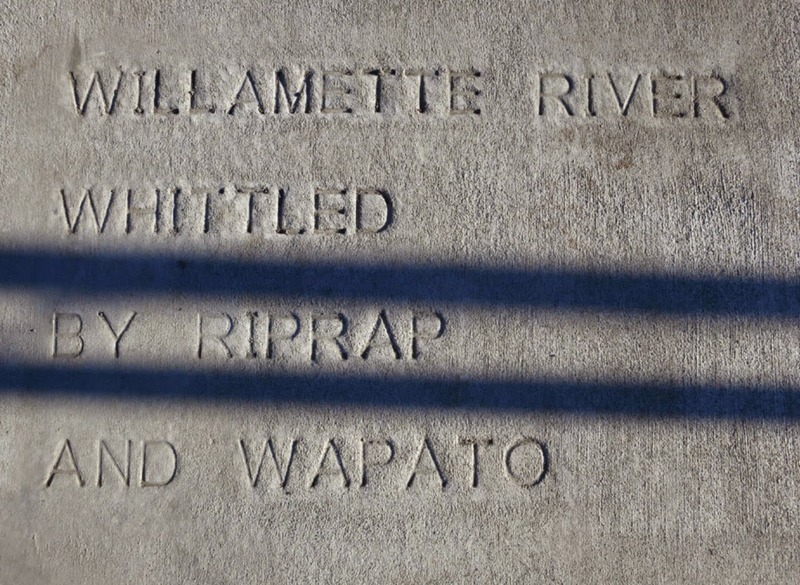 “WILLAMETTE RIVER WHITTLED BY RIPRAP AND WAPATO”, by Sara J. Call. 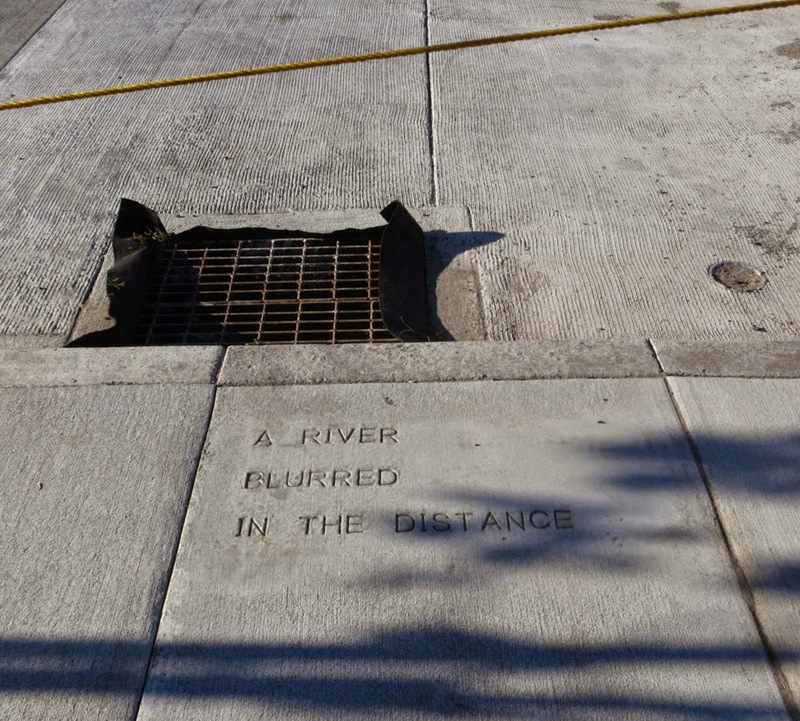 “A RIVER BLURRED IN THE DISTANCE”, by Anne Elizabeth Shaw. 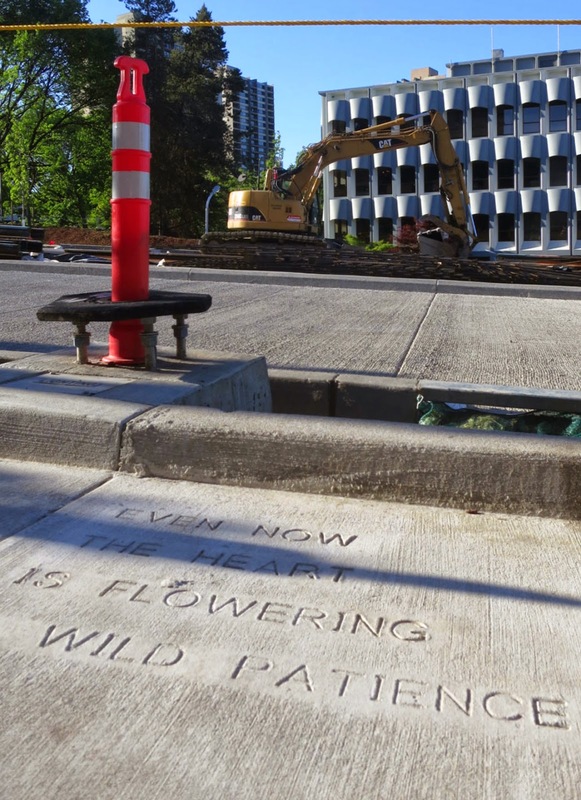 “EVEN NOW THE HEART IS FLOWERING A WILD PATIENCE”, by Amy Schutzer. 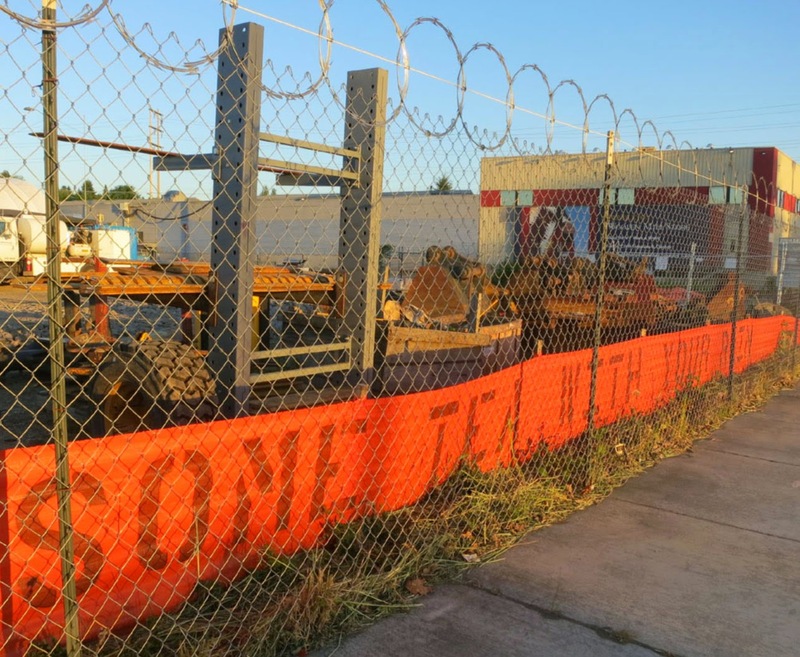 The light was so nice on this day, I kept traveling the light rail alignment to see what was new. 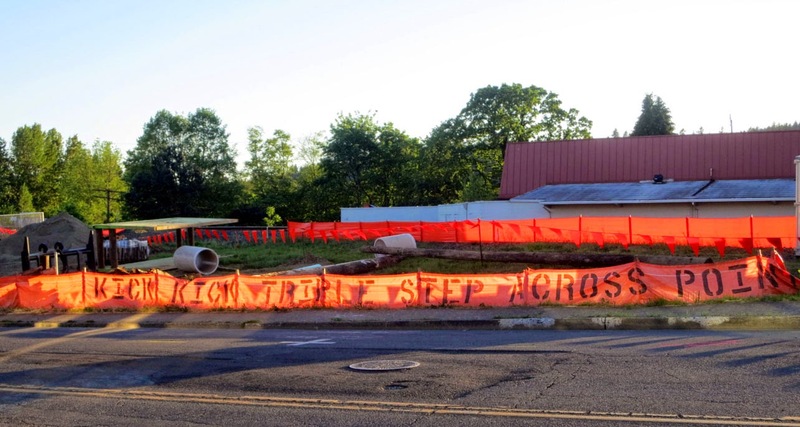 Here are a few more photos from the east side of the river. 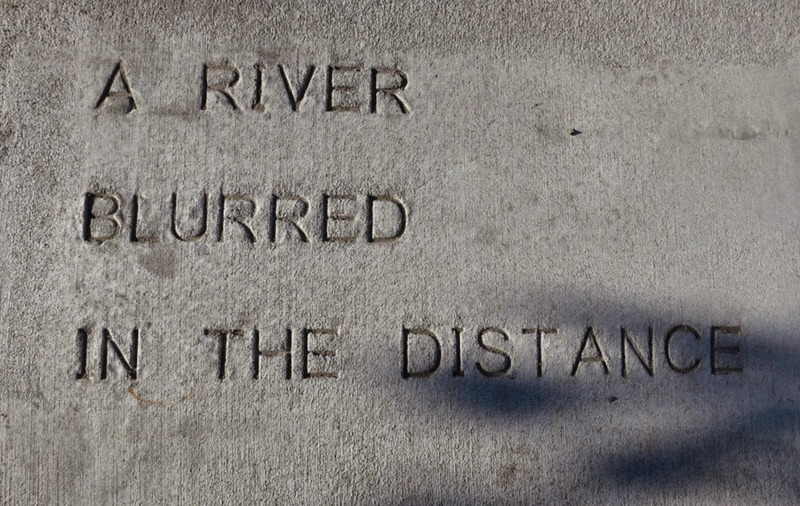 This line which looks out to the River reads “I SEE MOONLIGHT RUSHING ON THIN RIVERS OF STEEL”, and is by Gillian Zacharias. I’m hoping to get a photo of this from the River soon. 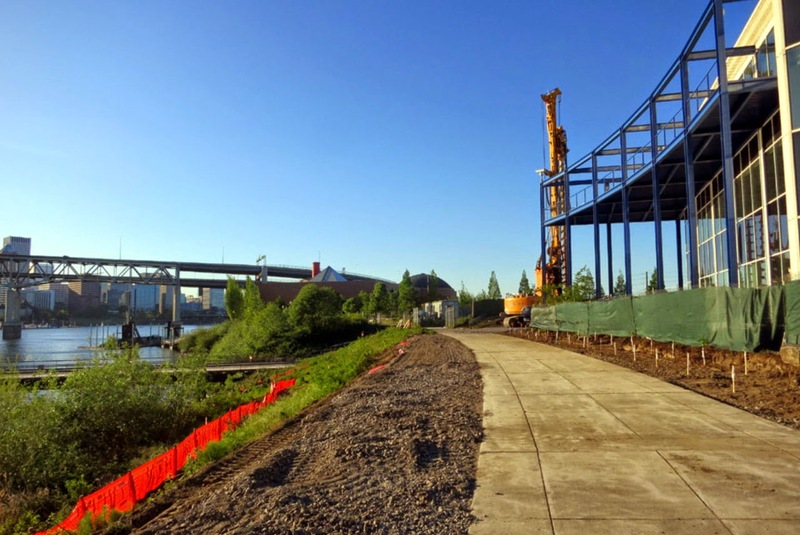 The bike path from OMSI to the Opera Center is closed now for construction. 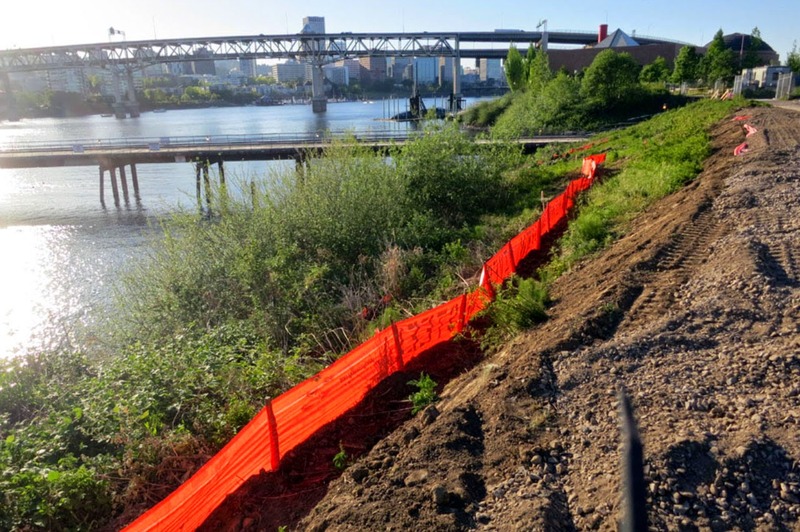 The line installed a month ago that was on the east side of the trail near here, has been retired. 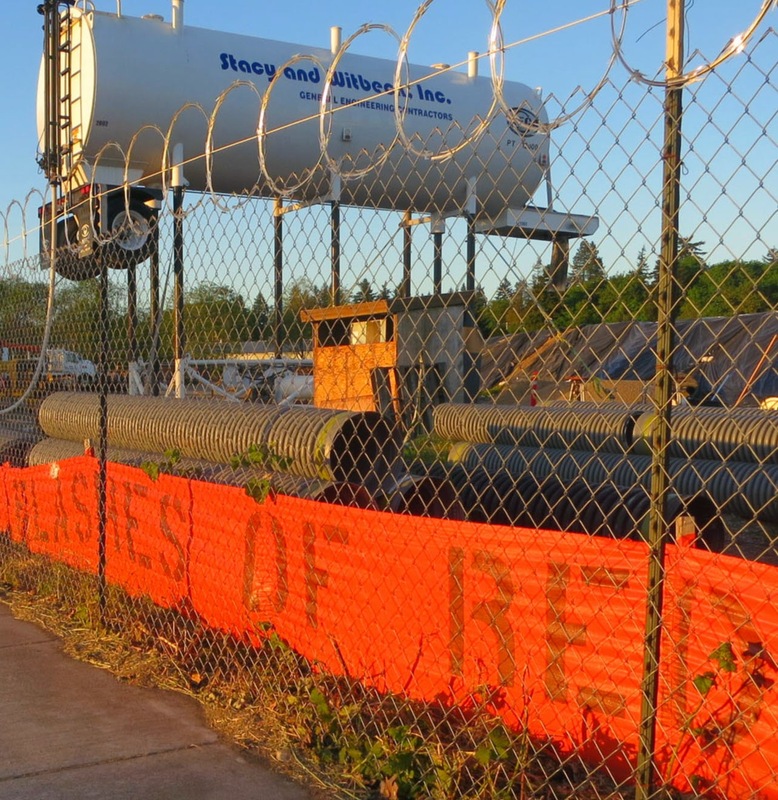 “EYE CATCHING A GAME OF SMALL SALUTES”, by Peg Butler is installed on SE McLoughin just north of the Pendleton Store, as are the next two lines. “WOULD YOU LIKE SOME TEA WITH YOUR RAIN”, by Kunal Mehra. “INTO THE LILT SONG INTO THE FLASHES OF RED”, by Gregory Chaimov. 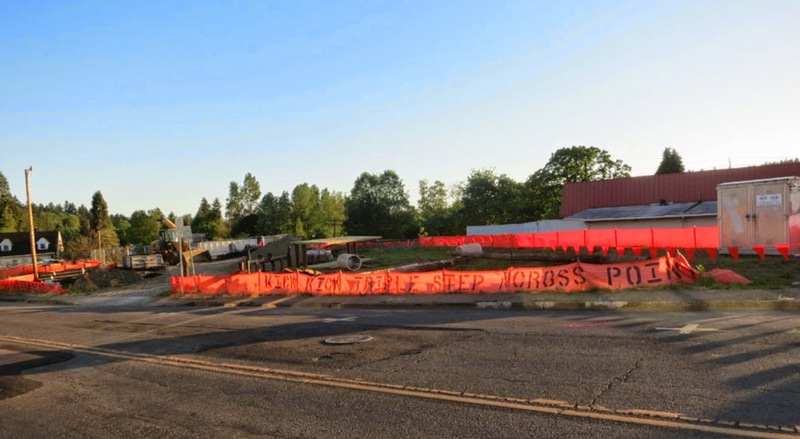 “KICK KICK TRIPLE STEP ACROSS POINT”, by Peg Butler is located in Downtown Milwaukie. The words in this line are dance steps in the line dance, “Walk the Line”.